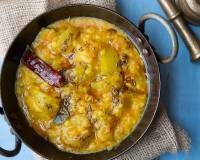 Sindhi Tridali Dal Recipe is a lip smacking Sindhi style dal made using three dals and the ghee tadka over it adds a rich flavour to the dal. 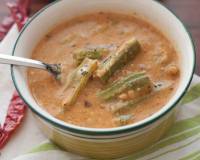 Piping hot tridali dal served with dodas is a classic combination you shouldn't miss out on. 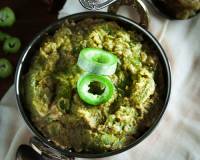 Sindhi Tidali Dal Recipe is a comforting sindhi dish best served with phulkas or even dodas. 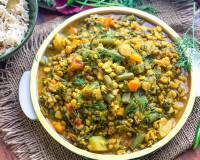 As the name suggests, 'tridali' means 'three dals' in Sindhi . 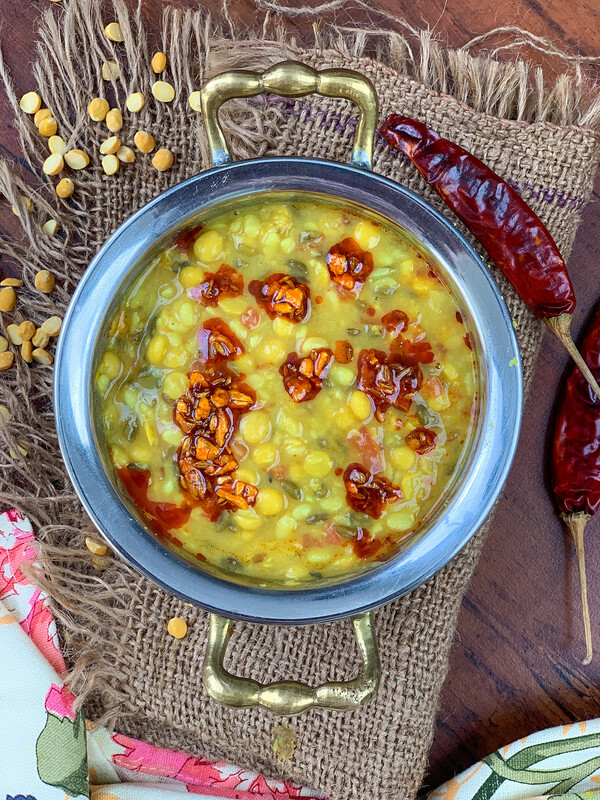 Three varieties of dals - chana dal, urdal dal and green chilka dal are combined and pressure cooked. A rich tadka, made using ghee and sharp garlic, along with some cumin seeds and asafoetida, add great flavour to the tidali dal. 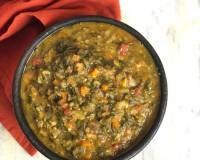 This tridali dal is made across all sindhi households as it is packed with nutrients. Serve Sindhi Tidali Dal Recipe along with Phulka, Sindhi Karela Jo Bhaji Recipe, and Pickled Onions for a simple weekday lunch. 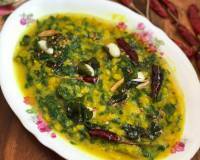 To begin making the Sindhi Tidali Dal Recipe, we need to wash the chana dal, split green moong dal and urad dal. Soak them together in a bowl for about 2 hours. In a pressure cooker, add the soaked and drained dals, salt to taste, turmeric powder, green chilli, tomatoes, and ginger. Add about a cup of water along with the soaked water and pressure cook for 4 whistles, and turn off the flame. Allow the pressure to release naturally, then open the lid of the pressure cooker and lightly mash it. Heat a tadka pan with ghee on medium flame. 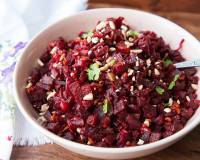 Once hot, add in the cumin seeds and asafoetida, allow it to sizzle. At this stage add the garlic and continue to cook until it turns into a deep brown colour. Once we have achieved the deep brown colour of the garlic, turn off the flame and add red chilli powder and mix well. 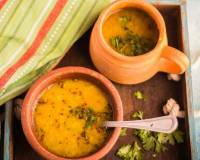 Pour this tadka over the cooked tidali dal along with the coriander leaves and mix well. Serve Sindhi Tidali Dal Recipe along with Phulka, Sindhi Karela Jo Bhaji Recipe - Sindhi Style Bitter Gourd Sabzi, and Pickled Onions for a simple weekday lunch.